There is a lot of interesting data in the Elon Poll on the upcoming 2008 US Senate race. According to them Dole’s approval rating is 50.4% approve, 24.7% disapprove. PPP's latest approval number for Dole was 45%. The difference between residents and likely voters could make up that difference, but PPP found many more respondents willing to say they disapproved of Dole-- 40%. Strangely, they also asked whether or not respondents were satisfied with Dole's representation of the state. Not sure what's the difference between approval and satisfaction, but 53.2% were satisfied, and 28% were dissatisfied. What this tells me is that the issues that North Carolinians are caring about when they pick a US Senator are exactly the issues that they are least satisfied about when it comes to Senator Dole; especially the Iraq War, but also the economy, health care, and even immigration. That cannot be good for an incumbent. Do you plan to vote [for or against] Elizabeth Dole as U.S. Senator from North Carolina? I don't like adding the "too early to tell" choice. That dilutes the poll results. Nevertheless, only 35% say they are surely going to vote for Dole. That is WELL BELOW the 50% mark and very dangerous for an incumbent. Democrats ought to be optimistic with this result. Nothing surprising to be found here. 35.1% of North Carolina residents say they intend to vote for a Democrat for Governor, while 32.3% say they will vote for a Republican. Of the people who say they intend to vote Democratic, 35.1% support Beverly Perdue and 27.3% prefer Richard Moore. That’s perfectly in line with our polling on the race. Among Republican voters… 11.8% support Bill Graham, 10.9% support Bob Orr, and 10.6% support Fred Smith. That closely matches the latest Civitas poll, but is different from PPP polling on the Republican primary, which has Graham with a stronger lead. The latest Elon Poll is out. Click here for the news release and here for the results. You can see some analysis already at Capital Beat. In the Democratic Primary Hillary Clinton is a big winner. Note, however, that these results consist of only North Carolina residents who say they will vote for the Democratic candidate for President. That is NOT the same as people who are LIKELY to vote in the Democratic Primary in May. In the Republican Primary Fred Thompson comes out on top. The same cautions that exist for the Democratic results, exists for Republicans too, though these numbers are very similar to Republican results we see coming from PPP and Civitas. The poll was conducted Sept. 24-27 and consisted of 664 North Carolina residents. More on the Governor and Senate campaign results in the Elon Poll later. The Triangle Community Coalition hired Ohio-based Fallon Research and Communications to conduct their latest poll. I honestly can’t find much out there about Fallon Research aside from their website. Most of their work appears to be on referendums for taxes, bonds, and land use. Here is how the website describes their past clients: “developers, citizens groups, real estate companies, home building associations, apartment associations, REALTOR® associations, zoning law firms, environmental groups and engineering firms.” This article describes them as a Republican polling firm, but I don’t see any other evidence of Fallon Research being explicitly partisan. Fallon Research appears to be a relatively new polling firm, but with lots of experience in the areas of housing and growth. The Triangle Community Coalition has released a poll of Raleigh and Cary municipal election voters. You can read about it here and get the results here (PDF). After reading through it the strongest message that comes through is that Raleigh and Cary voters are happy. The positively rate the quality of life and the state of the local economy; they think their cities are generally headed in the right direction; and they strongly approve of the work being done by their respective city councils. I think this chart sums up really well how Raleigh and Cary feel about growth. But I am not sure how this plays out in the upcoming Raleigh City Council elections, because I think all of the candidates fit into the “encourage growth, but manage it more carefully” category. The issues are really which controls to use. For example, some favor impact fees as a way to manage the costs of growth, while others do not. I will take issue with the following question. Which of the following would you say is the biggest benefit that comes from housing growth in your area? The TCC spins the result of this question to suggest that voters see low taxes as a benefit of growth, but I don’t think that’s true. People like lower taxes, so when the pollster provides the choice of “lower taxes” as an answer to this question, it’s not surprising that many people chose it. Besides, I don’t think that answer itself, a larger tax base, is true either. Sure the tax base is larger, but overall there are more taxes needed to be collected. The more people who move here, the higher taxes are going to be for everyone, so that we can catch up on the infrastructure needs likes schools, roads, water and sewer, and parks. Raleigh is relative low-tax compared to other similarly sized urban areas, and especially compared to other fast growing urban areas. I’d have liked to see the opposite question asked too. What is the biggest downfall from housing growth? The survey was conducted by Fallon Research and Communications between July 22 and 24. The survey consisted of 407 registered voters in Raleigh and Cary who have a history of voting in municipal elections. I've always been critical of the coverage of local elections by the News & Observer. Too few articles and very rarely do they actually get to the root of the political issues at hand-- something that any Raleigh politico could explain in a few minutes. It reminds me a lot of the coverage of student body president campaigns in college. This morning was different, N&O reporter David Bracken gave us a rather interesting story about Raleigh Council at-large candidate Mary Ann Baldwin's battle with the blogosphere. It got me thinking of why hadn't the N&O reported on our Raleigh City Council poll. Under the Dome reports on us all the time. Why not WakePol or Triangle Politics? Well I got my answer a few minutes later. See this post in WakePol. Not exactly the answer I was looking for. Here is my response in the comments. Regardless of whether you are a fan of polls or not, they are still news. And I think your readers would be very interested in the results. Not only do the polls tell you who is "winning" or "losing" but they tell you what the public is thinking on the issues at hand. Thanks for the link David. If anyone wants a direct link to our poll, instead of trying to find it on our website, it's here. After diving into the numbers for Elizabeth Dole's reelection campaign I thought it'd be fun to do the same with the Raleigh City Council survey. I produced some new crosstabs which I thought were especially interesting. Take a look at the some of the "issue questions" we posed on our last city council survey, cross tabbed by the three contested elections. I guess what is most interesting are the inconsistencies. For example, a majority of the supporters of Mary Ann Baldwin, Paul Anderson, and Jessie Taliaferro and a plurality of the supporters of Tommy Craven say they are more likely to support a candidate who will raise the impact fee, yet those candidates are on record saying that the current impact fee is fine. All candidates' supporters say they are less likely to support a candidate that receives large donations from developers. The N&O reported today on which candidates are receiving the most from the development industry. Some have pointed specifically to Baldwin, Anderson and Taliaferro as developer favorites, while the Triangle Community Coalition's straw poll (PDF) picked Baldwin, Will Best, Craven and Taliaferro. Even the other strong candidates Russ Stephenson, Nancy McFarlane and Rodger Koopman have gotten donations from developers of one kind or the other. But will major financial support from the development industry be a major issue in the campaign? Our polling certainly shows it as a liability and the N&O story this morning might be the start of more talk on the issue. The Sierra Club has endorsed Stephenson, McFarlane and Koopman. Most of their supporters favor the Sierra Club endorsement, but even some say they are less likely to support a candidate endorsed by the Sierra Club. For example, will the 25% of Stephenson supporters who don't like the Sierra Club endorsement change their minds when/if they learn of the endorsement? Who knows. Also of interest are the undecided voters. In the at-large race a strong plurality of the undecided voters like candidates who want higher impact fees, and a weaker plurality like the Sierra Club endorsement. In District A a smaller plurality (43%) like higher impact fees, while 32% don't. And unlike the city at-large, a plurality of undecided voters in District A don't favor the Sierra Club endorsement. In District B there is relative equal attitudes between those undecideds who favor higher impact fees, those who do not favor them, and those who say it won't make a difference in their vote. A small majority also say that the Sierra Club won't matter in their choice. That's not terrific news for strong challengers McFarlane and Koopman who have made impact fees a central focus of their platforms. They need to collect large majorities of the undecided vote to reach 50%. However opportunities do exist to make hay with the developer issue. Undecideds in all the races, as do all voters surveyed, don't like large donations from developers. Update (9/26/07): Note that the Triangle Community Coalition straw poll is not a scientific measurement, but a product of those people who showed up at the TCC pig pickin and chose to vote after listening to candidate speeches. I don't want anyone to think it was an endorsement or a true poll. It's just a straw poll. Thanks, Chris. A peek inside the numbers tells us about Elizabeth Dole’s potential weaknesses, where Grier Martin could make gains and why this race may be closer than it appears. According to our last survey, Dole topped Martin 45% to 30%. At first glance it may look like a strong 15 point lead. But let’s take a deeper look. Martin received support from only 45% of Democrats, while 32% were undecided. Among African-American voters Martin only garnered 37%, while 38% were undecided. Essentially, Martin’s percentage was much lower because he doesn’t have statewide name recognition. If all the Democrats- especially African-Americans- who usually vote Democratic do support Martin (which is likely) this automatically becomes closer to a 45%-40% race, not 45%-30%. This is where the informed vote question is helpful. If Martin were to run an effective campaign that was able to communicate simply his biography to the voters it could have a big effect. Take a look these crosstabs of the Dole vs. Martin question with and without the biography. Martin’s biography shores up support from Democrats (including the support of 67% of African-Americans). It also completely flips the unaffiliated support, while Republican attitudes remain largely unchanged. The biography also makes big gains by gender. Support for Martin goes up 15 points among men with the biography and up 20 points among women. With the biography Martin leads Dole by 11 percent among women. Dole doesn’t need to worry about Republican support. Even the rosiest portrait of Grier Martin doesn’t persuade them. Additionally, 70% of Republicans still approve of the President’s handling of the War in Iraq. That’s a tough nut to crack for any Democrat. However, the unaffiliated support and support from women that should be an advantage for a female candidate with a moderate image, like Dole, is surprisingly soft and susceptible to a Democrat with a biography like Grier Martin. Dole would be smart to worry less about her Republican base and work hard to project a moderate image. A smattering of posts on PPP's latest polls. According to the Civitas Poll proponents of a county transfer tax or sales tax have an uphill battle to fight. Would you support or oppose a referendum on the ballot in your County to increase the sales tax to help pay for local services? Would you support or oppose a referendum on the ballot in your County to increase the transfer tax to help pay for local services? But of course these are not state-wide ballot referenda, but only a few counties will be having such initiatives. This week the N&O reported that 16 counties will have transfer tax referenda this fall and 16 counties will have sales tax referenda. Five counties are having both, though a county may only impose one or the other. The local situation is going to have an impact on people's views towards these new taxes, but I think they will all start out behind. Nobody likes new taxes. Note that if you explained that the money went to pay for schools, then the number of people saying "yes" would go up. Update (9/24/07): Thanks new raleigh for pointing out the mistake. The second question should say "transfer tax" not "sales tax." Are business incentives a public opinion loser? They are according to the recent Civitas Poll. In a special session the State Legislature passed a bill giving $60 million in cash to five selected large companies employing more than 2000 people to invest in their facilities. Do you think the State should give big corporations cash payments taken from the taxes paid by small business and average taxpayers? Do you think it is better State policy to lower taxes for all business or to give cash incentives to a few big businesses to help protect jobs in the state? But a PPP survey conducted in April found somewhat conflicting results. According to that poll North Carolina voters did not support the $260 million deal for Google, but they did support the idea of business incentives to attract jobs. So are business incentives a public opinion winner or loser? I think the debate is still open, but it is VERY easy to turn the public against them. Update (09/24/07): Inside Politics in the Fayetteville Observer takes a shot at Civitas' question wording. When it comes to the situation in Iraq, do you approve or disapprove of the way President Bush is handling the war? Should Congress set a timetable for the withdrawal of troops from Iraq within the next year, or should Congress follow the President and keep troops in Iraq until the job is finished. It’s clear that a majority of North Carolina voters are unhappy with the War in Iraq and about half want Congress to get us of Iraq. Could Dean Smith beat Elizabeth Dole? Maybe. According to our latest survey former basketball coach Dean Smith fares better against Dole than any Democrat we have tested other than Governor Mike Easley. In a more likely scenario, we did further testing of State Representative Grier Martin against Elizabeth Dole. First was a question with no description other than their elective office and later the respondents were given an extensive biography of Rep. Martin. Click here for complete results to see the biography. Yes, you are reading that correctly. When respondents are given an extensive biography of Grier Martin he beats Elizabeth Dole. What does this prove? 1. The power of an informed vote question on poll results. 2. The incredible potential of a Grier Martin candidacy. 3. Grier Martin is currently far behind Elizabeth Dole and would need a well run campaign to effectively communicate that biography. Not to mention the fact that the Dole campaign will be doing everything it can to discredit him and tout her own impressive resume. Last year Raleigh raised the impact fee on newly built homes and businesses, taking the fee for a single-family home from 682 dollars to 1,170 dollars. Yet impact fees still pay for only 20 percent of new roads and parks projects required to support the new development, while the rest of Raleigh property taxpayers pay the other 80 percent. Do you think Raleigh should raise the impact fee on newly built homes and businesses closer to the statewide average of 4,038 dollars per single family home? Would you be more or less likely to vote for a city council candidate that supports raising the impact fee? Would you be more or less likely to vote for a city council candidate that received large donations from developers? Would you be more or less likely to vote for a city council candidate that was endorsed by the Sierra Club? After a month hiatus the Civitas Poll returns. There's a lot of savory polling goodness inside. Where to start? How 'bout starting with the easy stuff. Primary elections. I found this chart to be pretty interesting as well. More on the Civitas Poll later. Dole Memo or Press Release? Ryan at Under the Dome posted a polling memorandum released by Elizabeth Dole's campaign. Click here for the memo itself. There is not any new news. It just repeats that according to a recent poll Dole's approval rating is 64%. What I find interesting-- or humorous-- is that the Dole campaign tries to pass this off as a real polling memo and not what it really is-- a press release. PPP would never send a client such a brief memo that utterly lacks substance, analysis, and polling numbers. Russ Stephenson and Mary Ann Baldwin have a clear lead for the two at-large seats on the city council, with Paul Anderson a clear third. However, neither is anywhere close to the 25% needed to avoid a run-off. If everyone voted for two candidates as they are allowed, Stephenson and Baldwin would currently have the support of 13.5% and 13% of the votes respectively. A whopping 57.5% of the vote is still up for grabs. Incumbents Tommy Craven and Jessie Taliaferro have the early lead, but are below the magic 50% mark, signifying that an incumbent is vulnerable. Maybe that doesn’t mean much in a low intensity election like city council. I do know that strong challengers Nancy McFarlane and Rodger Koopman have yet to begin their direct mail campaigns and there are plenty of undecided voters left to swing the election. Click here for complete results. I’ll have more thoughts on the rest of the survey later today. Full Disclosure: I personally have donated and volunteered on behalf of Russ Stephenson and Nancy McFarlane. The Soup is going to be calculating running poll averages for North Carolina. So far they have done the gubernatorial primaries with PPP and Civitas data. I'm glad The Soup is joining the polling addicts club. Welcome! Our polling for the past year on Senator Elizabeth Dole has been very consistent. As you can see from the chart below her approval rating has hovered in the 40-50% range. Other than our polls there has been a scarcity of approval ratings for Senator Dole. Dole has released her own polls which show her approval in the 60s and during the winter a DSCC poll had her approval in the 40s. The last time Survey USA did an approval rating for Senator Dole was November where she scored a 52-40 approve/disapprove. Dole polling in fantasy land? Rob Christensen's column this morning reported that an internal poll conducted by Elizabeth Dole's reelection campaign has determined a job approval rating of 64%, while 24% disapprove. He failed to report that no other job approval rating taken for Elizabeth Dole has painted such a rosy picture. 64%-24% is out-of-whack with not only our polling, but polling of other Republican Senators in similarly "red" states. Update: Laura Leslie noticed too. Update 2: And Senate 2008 Guru. According to Ryan at Under the Dome there was some confusion over a quote from Bill Graham campaign strategist Tom Fetzer in the Dunn Daily Record. The quote seemed to suggest that Fetzer had seen polling with Graham beating all Republican and Democratic opponents. According to the Graham campaign that's not true and is was a misquote. So what was Fetzer trying to say? It's not often that we get a chance to gauge the true accuracy of a poll. The only time it can really happen is after Election Day. At no other time is a true census of opinion ever conducted. Tuesday was the first Election Day in North Carolina since this blog was started. Charlotte held its Republican Mayoral Primary on Tuesday with only 5% of eligible Republican and unaffiliated voters turning out. Incumbent Pat McCrory defeated challenger Ken Gjertsen, 67%-33%. So how did the Carolinas Poll, conducted August 15-19, fare? They predicted a 70% to 17% victory for McCrory. If you distribute the undecideds proportionally the result would be 80% to 20%. 80-20 vs. 67-33. That's not really close, but they got the big picture right; McCrory in a blowout. More results from the Charlotte Observer/WCNC Carolinas Poll-- this time its about crime in the Charlotte area. Only 12% of Mecklenburg County residents said they were worried about becoming a victim of a crime. 34% were somewhat worried, and 54% were either slightly worried or not worried at all. 55% said that the police were to doing a excellent or good job at fighting crime, while 33% said fair and 5% poor. Gary Pearce at Talking About Politics blogged about the tough race ahead for at-large Raleigh City Councilor Russ Stephenson. Pearce mentioned our initial polling on the race from July. I don't agree with his analysis, but I thought I should post the results again. Candidates have begun spending money as flyers are beginning to show up in mailboxes. 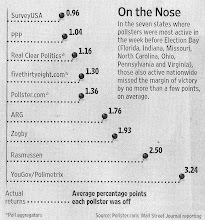 We will be polling again soon and it will be interesting to see how the race has changed. This made me smile...a recent Harris Poll of 2,694 adults nationwide says that North Carolina is the fourth most desirable state to live in. North Carolina trails only California, Florida and Hawaii. Right behind North Carolina was Colorado, Texas, New York, Arizona and Oregon. According to the Charlotte Observer/WCNC Carolinas Poll, 49.5% of residents of the Carolinas disapprove of how President Bush has handled the situation in Iraq. Only 27.5% percent approve. According to a CBS News poll cited in the article, 69% nationwide disapprove of the President on Iraq. Is 49.5% enough to make it an issue in upcoming Senate and Congressional races? While Republicans around the country were awaiting Fred Thompson’s presidential campaign announcement on the Tonight Show with Jay Leno, North Carolina Republicans were signaling their approval in Public Policy Polling’s latest tracking poll. Click here for complete results. Thompson remains the leader in most southern states and he is getting stronger in North Carolina. Giuliani dips another point, while Romney continues a steady climb – he’s up a point. McCain’s support remains at 7%, far below where he was at the beginning of the year. Clinton and Edwards tussle for the top spot for the third month in a row. If Edwards wins Iowa, I would bet his support in North Carolina would grow rapidly. If Edwards doesn’t win Iowa, would he even make it to the North Carolina primary? I’m beginning to feel like a broken record in this race. When will something happen to upset the balance? The bickering between campaigns has grown much louder this month. But so far the voters haven’t budged. This race hasn’t changed one bit in months. Wake me when something happens. Senate 2008 Guru posts an analysis and introduction of State Rep. Grier Martin as a potential challenger to Senator Elizabeth Dole. He uses a lot of PPP data. Take a look. It's important to note that the poll questions using Grier Martin and Kay Hagan were accompanied by short descriptions of their biographies. Therefore, comparing the poll numbers between them and other candidates like Brad Miller or Roy Cooper is like comparing apples... and uh, pears. In a straight up poll- Elizabeth Dole vs Grier Martin with no other descriptors, Dole is going to be ahead by double digits but below 50%. What our polling shows is that if Grier Martin can successfully communicate his biography to the electorate, then his numbers shoot up significantly. More from the Charlotte Observer/WCNC poll, this time the topic is interracial friendship. According to the poll most Charlotte area residents have personal friends of another race and a plurality met that person at work. Do you currently know someone of another race whom you would consider a personal friend? Q. Of the following Republican candidates for president, which one -- if any -- would you be most likely to vote for? Q. Of the following Democratic candidates for president, which one -- if any -- would you be most likely to vote for? Caution: The poll was not of likely primary voters and the methodology is quite unorthodox. Also, Fred Thompson, the leading Republican candidate in North and South Carolina was not included. This poll is not a good measure for predicting any sort of electoral outcome. However, I thought the political expert that the reporter interviewed was genius.